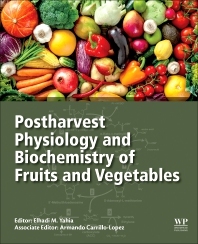 Postharvest Physiology and Biochemistry of Fruits and Vegetables presents an updated, interrelated and sequenced view of the contribution of fruits and vegetables on human health, their aspects of plant metabolism, physical and chemical/compositional changes during the entire fruit development lifecycle, the physiological disorders and biochemical effects of modified/controlled atmospheres, and the biotechnology of horticultural crops. The book is written specifically for those interested in preharvest and postharvest crop science and the impact of physiological and biochemical changes on their roles as functional foods. A full-time Professor-Researcher at the Autonomous University of Sinaloa. Professor Carrillo-Lopez is a member of the National Academy of Scientists for Mexico. He serves as lecturer for postgraduate programs and is thesis director for graduate and undergraduate students.